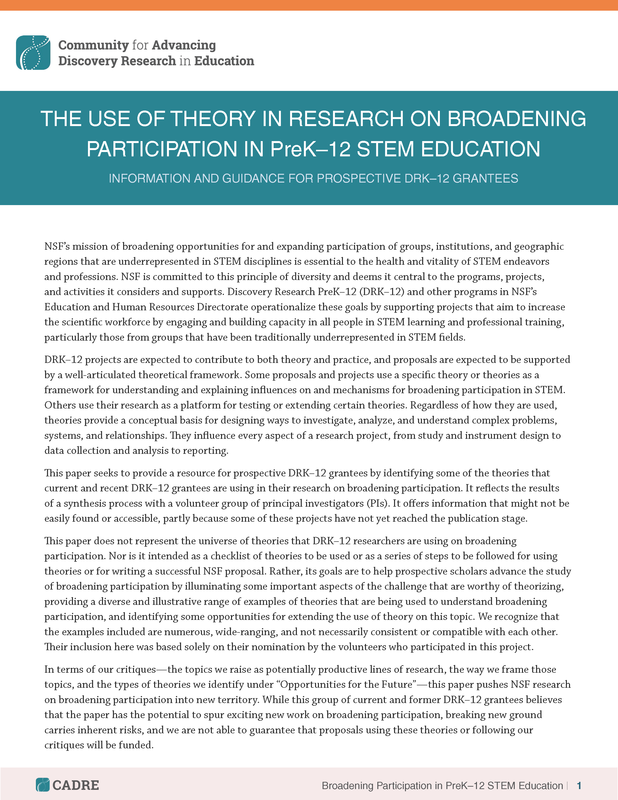 This paper seeks to provide a resource for prospective DRK–12 grantees by identifying some of the theories that current and recent DRK–12 grantees are using in their research on broadening participation. It reflects the results of a synthesis process with a volunteer group of principal investigators (PIs). It offers information that might not be easily found or accessible, partly because some of these projects have not yet reached the publication stage. NSF’s mission of broadening opportunities for and expanding participation of groups, institutions, and geographic regions that are underrepresented in STEM disciplines is essential to the health and vitality of STEM endeavors and professions. NSF is committed to this principle of diversity and deems it central to the programs, projects, and activities it considers and supports. Discovery Research PreK–12 (DRK–12) and other programs in NSF’s Education and Human Resources Directorate operationalize these goals by supporting projects that aim to increase the scientific workforce by engaging and building capacity in all people in STEM learning and professional training, particularly those from groups that have been traditionally underrepresented in STEM fields.